If you’re into smart home automation, you’re bound to hear about Z-Wave technology, or Z-Wave hubs, or Z-Wave something or another. 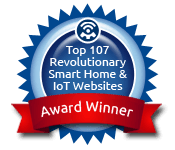 That’s because Z-Wave wireless technology has become the go-to smart home communications protocol for the everyday homeowner who wants an affordable, do-it-yourself home automation system. But why is Z-Wave so popular? Well, for quite a few reasons. To understand Z-Wave’s popularity, you first have to understand how it works. In simple terms, Z-Wave is a wireless communications protocol that works sort of like Wi-Fi or Bluetooth, yet is also remarkably different. Z-Wave works as a mesh wireless technology. Instead of requiring the wireless signal to travel directly from the source to the receiving device, Z-Wave mesh network technology allows every Z-Wave device in your system to talk amongst one other. That means the reliability and signal range are superb. In more technical terms, Z-Wave devices use radio frequency (RF) waves to communicate with each other. A single Z-Wave network/system can support up to 232 Z-Wave devices, also known as nodes. Do note that Z-Wave devices work on different frequencies in different countries. If you’re in the United States or Canada, you’ll want to purchase Z-Wave devices that use the 908.42 MHz frequency. European devices operate on the 868.42 MHz frequency. When you’re ready to build your own Z-Wave system, you’ll start by purchasing a Z-Wave hub, also known as a network controller, or simply a controller. The hub serves as the system command center. Many different Z-Wave hubs are available, and they all have their own way of operating, but fundamentally, the hub is what allows you to program the rest of your system, monitor operations, and change functionality as you wish. Once you have a hub, you can build out your system with Z-Wave devices, including everything from Z-Wave motion sensors and alarms to Z-Wave light bulbs and ceiling fan controls. Devices are easily enrolled into your hub with a couple of button presses on the device, and a little programming through the hub’s software. Once this process is finished, you’re ready to enjoy your Z-Wave system, accessible anywhere through a mobile app or web browser. Why is Z-Wave So Popular? 1. Z-Wave hubs allow remote control over the Internet: Believe it or not, there are smart home systems that don’t have this capability. With Z-Wave, however, remote web access comes standard. You can log into your smart home system from anywhere in the world, through any device that has an Internet connection to check on your property, adjust device settings, and more. 3. Z-Wave is affordable: High-end automation systems that cost thousands of dollars are no longer the only option for people who want a quality smart home system. While Z-Wave isn’t the cheapest option out there, it’s the most reliable middle-of-the-road solution that doesn’t break the bank. 4. You can set up Z-Wave yourself: Z-Wave hubs and devices are designed for the DIYer. You may need tech support at times (provided free by Home Controls), but for the most part, you can build your Z-Wave system without help from a professional installer. 5. Z-Wave isn’t going anywhere: This technology is here to stay, and that’s a huge plus when you’re investing in a smart home system. In this cutting-edge home automation industry, startup developers go out of business on the regular, often leaving their early adopters out of luck for support or future products. With Z-Wave, that risk almost non-existent thanks to the technology’s huge popularity both with homeowners and product developers. 6. Optional integration with other technologies: Because Z-Wave is already so popular, many product developers have made it possible to integrate Z-Wave systems and individual devices with other types of smart home automation or security systems. If you have a traditional wired alarm system installed at home, for example, you can connect a Z-Wave hub to enable remote access over the Internet and integrate new Z-Wave devices into your existing system. And that’s just one example. The options for integration are nearly endless. 7. Z-Wave is secure: Z-Wave systems typically don’t get hacked due to vulnerability in a Z-Wave hub or connected Z-Wave device. Those products are locked down by bank-grade encryption. The main reason a Z-Wave system ever gets hacked is due to an insecure Internet connection, and that’s easily avoidable as long as you care. Secure your home network, and your Z-Wave system will stay secure with it. And What is Z-Wave Plus? When you work with Z-Wave, there’s one final major aspect to know about the technology — the difference between “Z-Wave Plus” devices and other Z-Wave devices. When Z-Wave first came on the scene, devices made by various manufacturers weren’t as compatible as they were chalked up to be. To solve that problem, “Z-Wave Plus” certification was organized. Also known as the 500 Series, the 5th Generation, 5Gen, Gen5, or Next Gen Z-Wave, the new selection of Z-Wave Plus devices helps ensure interoperability among different manufacturers’ devices. Z-Wave Plus certification makes it easier to shop for Z-Wave devices, as there is rarely a need to worry that these devices won’t work correctly with your specific Z-Wave hub. Previous generation Z-Wave devices are still available, as well as Z-Wave devices that just don’t meet “Plus” certification requirements, so buyers have to be careful to make sure any non-Plus devices really work with their Z-Wave hub. Of course, don’t let that scare you away from non-Plus devices. Home Controls provides an extensive Z-Wave Compatibility Guide to help eliminate confusion when you’re trying to match devices to your hub. No matter what your goal is for your Z-Wave system, Home Controls offers everything you need to get started, including free product advice, custom system designs, and tech support. As a one-stop shop, we carry hundreds of Z-Wave products from the top Z-Wave manufacturers, allowing you to build your system without shopping in several different places. 2 Comments on What is Z-Wave, and Why Is It So Popular? Could I have different brand products working with same Z wave plus hub? In theory all Z-Wave parts “should” be compatible, however, in reality, not every Z-Wave part works with every hub. Our experience shows that most newer devices will work with most newer hubs. We do have compatibility lists and you can always call us to ask about specific devices working with your hub.